The front cover of Life Magazine, May 30, 1955, featured a colour photo of Historic Playing Cards commemorating early U.S. events and heroes whilst the accompanying article inside the magazine displayed the masterpieces of colonial designers who created native styles as statesmen were building a new nation... Long before 1776 the independence of America was being declared by its arts and manufactures.. silverware, guns, furniture, houses & playing cards... The court cards shown are in fact from the Seminole Wars deck by J. Y. Humphreys, Philadelphia, c.1819, whilst the Ace of Spades is from Jazaniah Ford's Decatur deck, 1815. After the Americans got rid of a king as a ruler they decided to eliminate royalty from their playing cards. General Washington himself became the king of hearts in the rare historical deck illustrated below. Thomas Jefferson is the king of clubs, John Quincy Adams the king of diamonds and General Andrew jackson (the Commander of the War) is the king of spades. The queens are classical divinities - Minerva the queen of spades, Venus the queen of hearts, Ceres of clubs, Justitia of diamonds. Jacks (or knaves) are Indian chiefs - Gy-ant-wachia the jack of diamonds, an unidentified chief the jack of spades, the Iroquois Joseph Brant the jack of clubs, Red Jacket the jack of hearts. 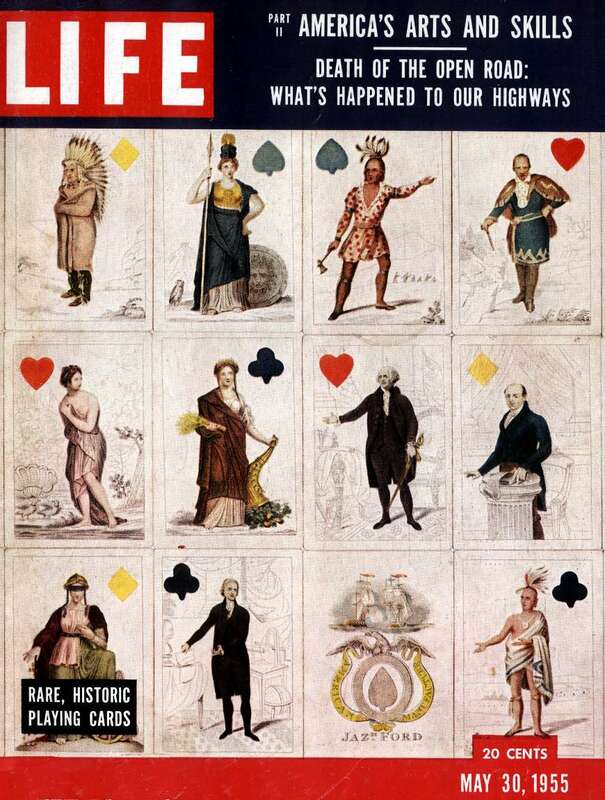 Above: the front cover of Life Magazine, May 30, 1955, featuring Historic Playing Cards commemorating early U.S. events and heroes. The court cards are from J. Y. Humphreys' Seminole Wars deck, c.1819, whilst the Ace of Spades is from Jazaniah Ford's Decatur deck, 1815. The cards are hand-coloured with stencilled pips. U.S.A. Homepage • Lewis I. Cohen • Andrew Dougherty • Samuel Hart • Thomas Crehor c.1850 • Strauss & Trier • Lawrence & Cohen • New York Consolidated Card Company • Continental Card Co. • Russell & Morgan Co., (1881-1894) • National Card Co., (c.1886-1894) • Winters Art Lithographing Co. If any collector wishes to contribute images of early American cards to these pages, hi-res scans will be appreciated and acknowledged.